Di has always had a keen enthusiasm about listening to the stories that people tell about their lives, or reading about them in biographies or memoirs, and in recent years has been working with a number of people to record their life stories. Biography or Memoir is popular reading material in libraries and bookshops. Di first became fascinated with these stories while a nursing student at a country hospital in country South Australia in her late teens. Despite the fact that she was an enthusiastic writer of stories and letters, with a number of penfriends around the world and in Australia, the idea that she would be a writer was not on her radar. When working in a medical ward as a junior trainee nurse, she spent considerable time midst her duties talking to a number of elderly ladies about their early life. Di can still recall saying something like “Someone should write your story – it is so fascinating.” However that did not happen. 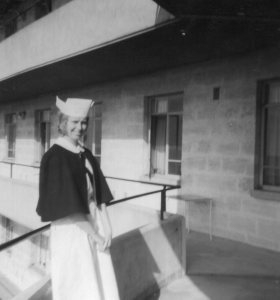 Nursing trainee at Mt Gambier Hospital, South Australia – 1960’s. It was much later that Di chose to write life stories as well as short stories and articles.